Pete Chatfield from Household Money Saving likes to find the easiest ways to cut costs and earn a little extra. His friends might call him lazy, but we think he’s energy efficient! You decide – we’ve found out more about Pete and his blog. 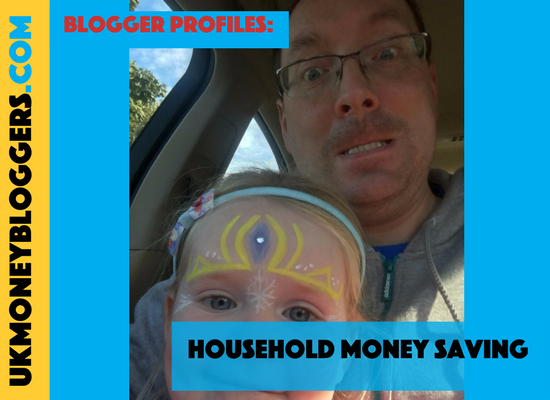 Household Money Saving is (rather surprisingly) about saving money on your household bills, and also looks at ways of earning extra. I try to look at methods that don’t take too much effort, as that reflects how I do things… or I’m lazy, as my friends will probably tell you! I’ve been obsessed with money since a young age. My mum tells me that when I was around 5 or 6, I would walk into a shop with 50p and know exactly how much my sweets would come to and how much change I was due. And as the saying goes, “money makes the world go round”, so what better subject to write about? I have constantly given advice to friends, colleagues and family about how to save money for as long as I can remember. A lot of it is so simple to do, yet lots of people don’t seem to be willing to give up a few minutes of their day to save possibly £100’s a year. So I thought that if it was all written down, people might be more willing to pay attention. I looked at setting up a website, but saw that a blog might be more appropriate. In truth, I had never even read a blog before the summer of 2016! This has to be Earn Money From Home. I think many people would like to earn extra or give up going to work altogether, so that’s why they head there. Definitely Save Money on Sky TV (or other pay TV) Contract. It’s one of my earliest posts, but I think it’s good advice – even if I do say so myself! I know plenty of my friends and family have saved at least 50% on their contracts. People will often walk away with a 10% discount and think they’ve done well, when really it’s Sky who have the better end of the deal. Never, and I mean NEVER, let a contract renew automatically. That covers everything from insurance to broadband to breakdown cover. You will almost always find a cheaper deal elsewhere. And even if you want to stay with your provider, by giving them a quick call, they will usually give you a better deal. Don’t come to me for advice… but if you must, don’t be afraid to go over old posts. As time goes on, you’ll find ways to improve posts and your writing style will develop. If you don’t like bits that you have written or you could add extra information to help readers, then go for it. I think it’s important for bloggers to look out for each other and also to share ideas. There are some great bloggers on UKMB, and it’s one of the most useful and helpful groups I’ve belonged to. Ricky Willis and Emma Drew – I was so impressed with their blogs, and they are partly the reason why I took up blogging. And Andy Webb because I love the feel of his blog and the content he produces.